He recently played well in the BPL for Comilla Victorians. 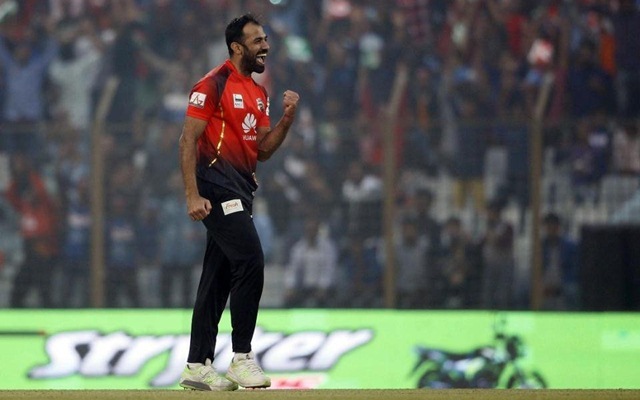 Peshawar Zalmi and Pakistan pacer Wahab Riaz has revealed that he is hoping to get a place in the Pakistan World Cup squad by impressing the selectors with his performances in the fourth edition of the Pakistan Super League (PSL). Having played his last ODI in June 2017 against India in the Champions Trophy, the 33-year-old has still not lost the hope of making an international comeback before the biggest cricket event beginning on May 30 in England and Wales. Riaz has consistently been one of the best bowlers in the PSL, but in ODIs, he has struggled a lot. He recently plied his trade in the Bangladesh Premier League (BPL) for the Comilla Victorians who won the title. Wahab Riaz was one of the best performers for the team and also did well in the final when it mattered the most. “PSL is a good opportunity before the World Cup. I have been bowling well in the leagues and I hope through my performance in the tournament I can become a part of the national squad,’ Riaz said while speaking to Geo TV. “Sure we play a lot of leagues and tournaments but there is nothing that comes close to playing for your country,” he added. Peshawar Zalmi will play their first game of the season against the Quetta Gladiators, but the left-arm pacer is looking ahead to playing against Lahore Qalandars, as he wants to bowl to AB de Villiers. “AB is one of the most destructive batsmen of the modern era and he is one of my favourite batsmen. I am looking forward to bowling to him. You can expect to see a healthy competition on match-day,” he said about the challenge of bowling to one of the best batsmen in the world. This year, the last eight matches of the total 34 matches of PSL will be played in Pakistan — with three in Lahore and five in Karachi. Wahab Riaz feels this is an excellent move to revive the game in the cricket-starved country. “I want to congratulate the Pakistan Cricket Board for scheduling the matches in Pakistan. It is an excellent initiative which will help with the revival of international cricket in the country,” he further added.